“It took us almost nine months to build Boa Redux,” states Hitti. 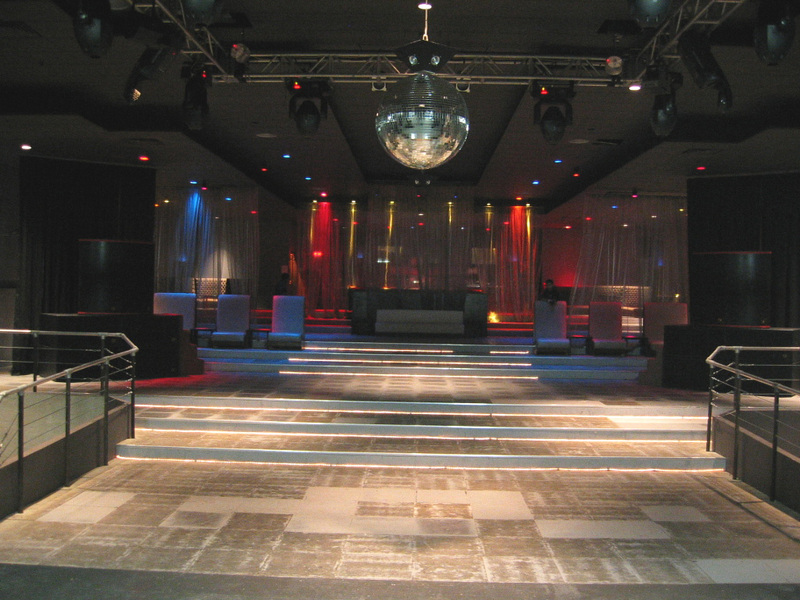 “We stripped it down to the ground, and built the perfect acoustic room. The main room tiers of Boa Redux. Photo courtesy of Carey Britt. 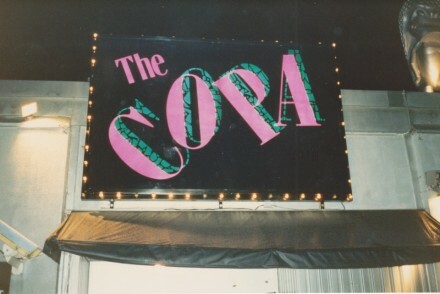 Also core to the identity and function of Boa Redux was the fact that the club would operate specifically during late-night hours, and without a liquor licence. “There were two reasons for that. One, the liquor board hated my guts because for 10 years they tried to shut Boa Café in Yorkville down, and they couldn’t. I knew that if I wanted to licence a space that big, I’d be in for a big fight. I also knew that I would have a fight with [then city councillor] Olivia Chow, because the area over there was not licensed for clubs of that size. I got around that by making it into public hall. I love challenges. 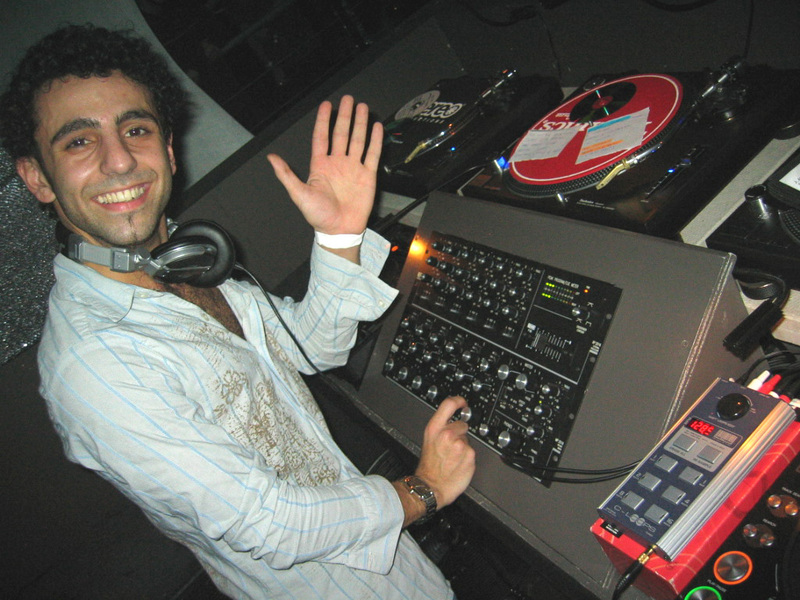 In order to court in-the-know clubbers, Hitti hired a team of talent bookers and promoters that included Ralf Madi and Carey Britt. Madi had worked at The Guvernment while Britt was a booker for Most Wanted Entertainment. The two men had also collaborated on numerous productions, including under the Project Orange banner. 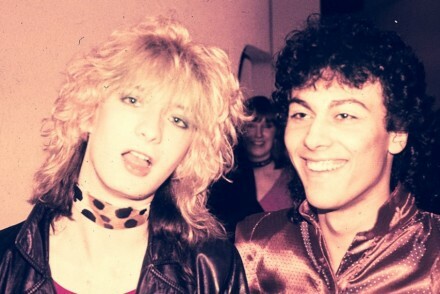 They knew Toronto’s big-room scene well, and got to work crafting Boa’s musical focus months in advance of opening. 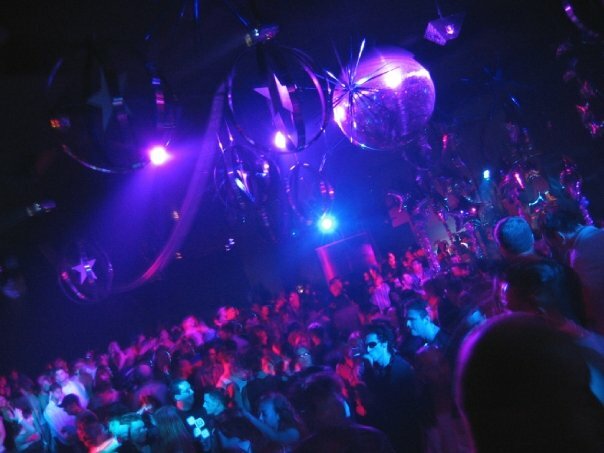 After a few “soft launch” parties featuring DJ Sean Miller in its lounge, Boa Redux announced itself on a larger scale with the booking of Sander Kleinenberg in December 2003. By January 2004, the new Boa was in full swing. 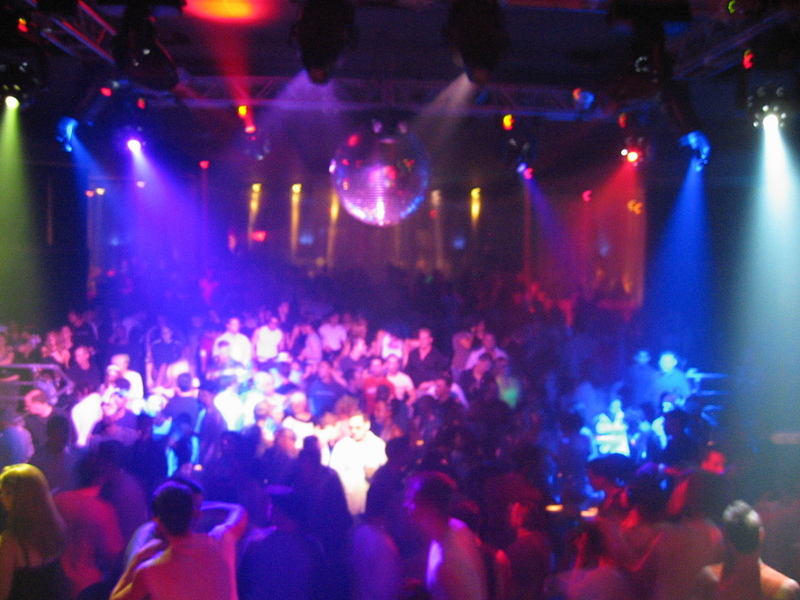 Sander Kleinenberg (December 2003) was the first large production at Boa Redux. Flyer courtesy of Jeff Button. Boa in action. Photo courtesy of Rony Hitti. Why it was important: “You would never know that Boa was a club from the outside,” says Sean Miller, the DJ/producer who became the club’s star resident. “You’d come in the back door, and just be transported to another world. It is the incredible quality of sound at Boa Redux that most defines its reputation to this day. “It was a floating room, meaning that the floors were raised and hollow, there was a drop ceiling, and the walls were built out from the exterior walls and insulated,” explains Britt. “I have heard the same Dynacord sound system in clubs like Space Miami, Pacha New York, and The Docks, but none of them came even close to sounding as good as Boa’s room. Boa Redux promoter Erica Kelly and talent booker Carey Britt. Photo courtesy of Britt. 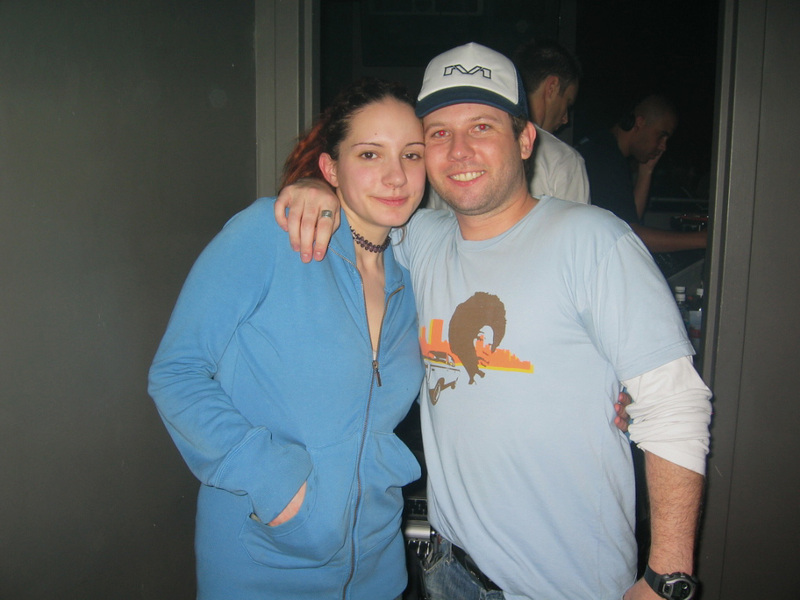 As Boa’s Music Director and Marketing Manager, Britt was most responsible for the DJs who entertained those bodies and put Boa’s sound system to the test. At the start, he worked most closely with Madi, as well as respected club promoter Edward “Eddy K” Kwak and Erica Kelly, a young clubber who Eddy suggested be brought on board for her impressive street-promotion skills and guest-list abilities. Collectively, they decided to focus Boa’s programming on emergent artists and sounds, with a focus on both local and international talent. DJ Demi on the decks at Boa Redux. Photo courtesy of Carey Britt. Demi was signed to a bi-monthly residency, Chus+Ceballos played quarterly, and a monthly Def Mix showcase offered appearances by house-music legends like David Morales, Frankie Knuckles, Satoshi Tomiie, and Hector Romero. “The [Def Mix guys] rarely appeared in the city post-Industry, and they made Boa their home,” says Britt. Boa may not have had the budget or connections of competing clubs like The Guvernment and System Soundbar, but the team was creative. “Carey found the buzz, the good new music, and we had to make it grow to suit a venue of that size,” credits Erica Kelly. DJ/producer Sean Miller at Boa Redux. Photo courtesy of him. Toronto’s own Sean Miller was exactly that. Though he’d come up playing raves and a number of parties produced by Britt, Miller was far from a well-known name in this city when he started as Boa’s main Saturday DJ. When Miller started spinning every Saturday at Boa, he had just begun producing. He’d generally play from 1 to 4 a.m., warming up for international headliners. “I’d focus on setting the atmosphere and making people feel good,” Miller explains. As time went on and crowds responded, Miller was often booked to play extended sets, sometimes DJing from 1 a.m. through to noon the next day. These were especially helpful skills as Miller’s career exploded, with releases on labels including Chus+Ceballos’ Stereo, Steve Lawler’s Viva Music, Anja Schneider’s Mobilee, and Satoshi Tomiie’s Saw Recordings soon taking him around the world. When asked what, in addition to its sound, most made Boa Redux a unique experience to him, Miller has no shortage of answers. “First and foremost was the space itself, as an old theatre,” he describes. “There was also the fact that it wasn’t in the club district. Whoever came to Boa was committed to us the whole night. It didn’t open until 1 a.m., and the headliners went on at 4 a.m., so people could come after other experiences. We had a bit of a different, older crowd. It was expensive to get in—like $30 or $40—because there was no other revenue stream, and it was very much based around the guest DJs. “If I fit in, you fit in,” echoes Kelly. “It didn’t matter what your deal was. I met old-school rave icons, Yorkville salon owners, lawyers, doctors, strippers, and bodybuilders, models, teachers, audio fanatics, breakdancers, artists, and international DJs. Even Tiesto came through one night. Friends at Boa Redux. Photo courtesy of Rony Hitti. Boa’s steep cover charges may have skewed its crowd to the older and more fashion-conscious end of the dance club spectrum, but one had to appreciate the venue’s commitment to the basics. Sean Miller (left) with Kenny Glasgow. Photo courtesy of Erica Kelly. 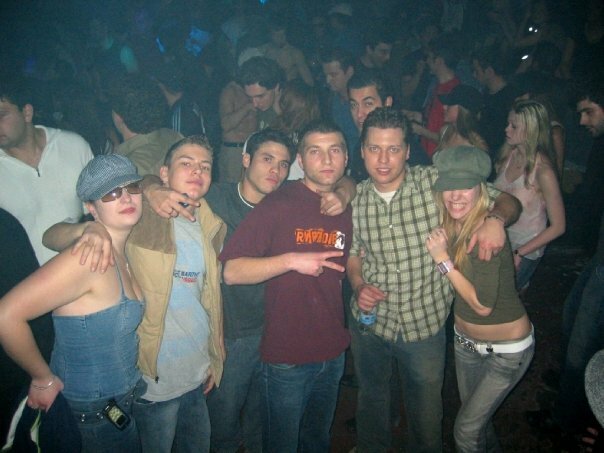 Who else played/worked there: When asked about standout events at Boa Redux, everyone I speak with mentions the June 2004 appearance of New York’s Danny Tenaglia, who played to more than 3,000 people over the course of a marathon 18-hour set. It had been years since Tenaglia had played Toronto, and the Boa team worked hard to bring him to their club. Tenaglia did indeed love Boa, and signed the club’s stage to say exactly that. Danny Tenaglia’s appreciation of Boa Redux signed on the club’s stage. Photo courtesy of Carey Britt. 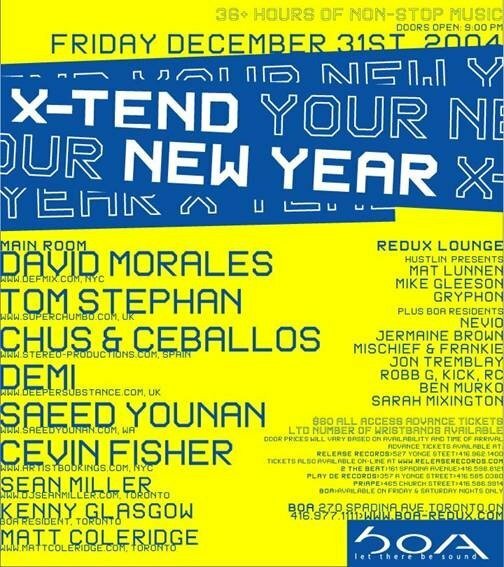 Another event that put Boa Redux on the map, both locally and globally, was the X-Tend Your New Year blowout that brought in the year 2005. That party went for two days, with more than 4,000 people attending to hear a massive lineup of DJs that included David Morales, Tom Stephan, Saeed Younan, Cevin Fisher, Chus+ Ceballos, Demi, Miller and more than 20 other Toronto talents. 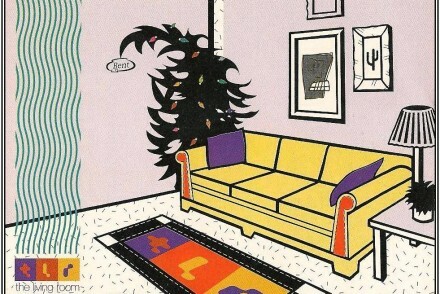 New Year’s Eve flyer courtesy of Rony Hitti. British DJ/producer Demi may well have played Boa more than any other international guest. 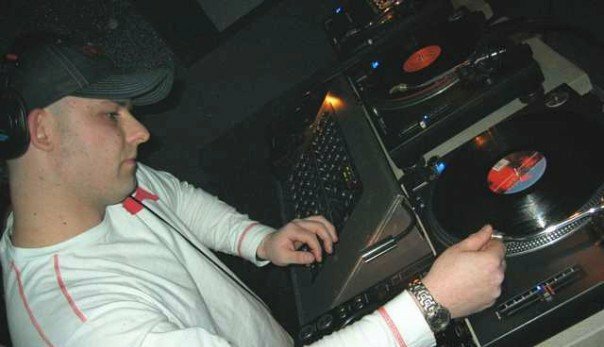 Live mixes from his many appearances can easily be found online, including his full set from BringtheBeat’s “Mad Hatter” event in October 2004. Friday nights at Boa may not have attracted the large, consistent crowds of Saturdays (“It’s very hard to do an after-hours on Fridays; Fridays, you need liquor,” says Hitti), but they certainly were interesting. “Fridays were our night to take risks outside the tribal and progressive house genres emphasized so heavily on Saturdays,” explains Kelly. Mat Lunnen of Hustlin’ plays at Boa. Photo courtesy of Jeff Button. Fridays featured a lot of impressive local talent, including parties like Chemistry, with DJs including Matt Coleridge, John Tremblay and The Dukes, and Hustlin’ with DJs Mat Lunnen and Mike Gleeson. Black Light Activists produced a number of psy-trance events, complete with their signature glowing artwork. There were occasional breaks events, with DJs including The Phat Conductor, Big League Chu, and Dave Saddler. Other locals who played Fridays included Mischief & Frankie, Mario J, Adam Marshall, Robb G, Jon Tremblay, Lady Lindzee, Jason Hodges, Jonny White, and Nitin. 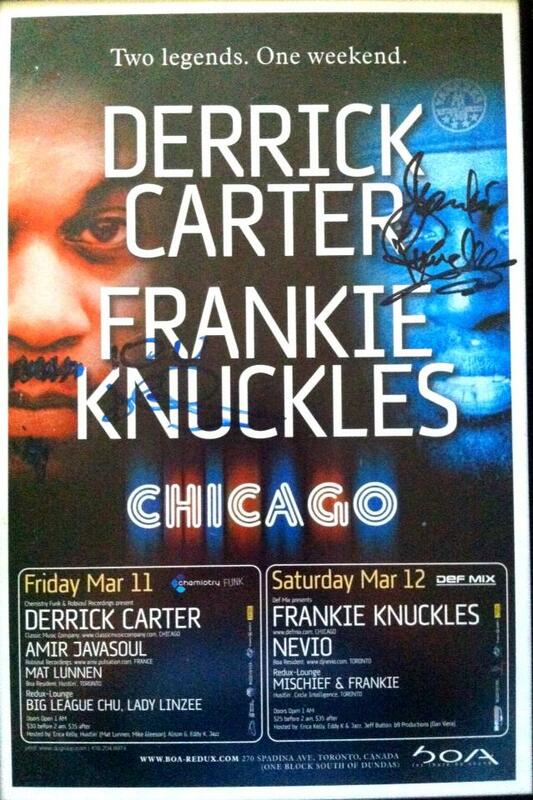 Autographed Derrick Carter & Frankie Knuckles poster courtesy of Erica Kelly. And while DJs of all sounds and stripes pounded out the beats in Boa’s main room, DJs like the supremely soulful Jermaine Brown brought a more chill, funky sensibility to Boa’s lower lounge. Just as this is not a comprehensive list of all who DJed at Boa Redux, it is equally impossible to list all of the promoters, bartenders, door staff and others who made the club function. Kelly mentions that other key promoters included Kevin Noel (now of Platform), Jeff Button (now best known as a DJ), and Pat Boogie (Boogie Inc.). Hitti gives props to head bartender Bart (now general manager at Yorkville’s Amber bar) and head doorman Edwin Harris (now at Club V). Jeff Button (middle) and friends at Boa. Photo courtesy of Button. What happened to it: Boa Redux made a big splash, but had a storied crash, complete with rumours, innuendo and infighting. Legal battles that ate up a great deal of Boa’s 2005 and Hitti’s cash also played a huge role. Kelly, who stayed on at Boa after Britt and others had quit, confirms that an expensive “year-long court case against the landlord” took its toll. “When Carey decided to leave, it was a really hard decision for me to stay,” she says. “I understood that financially we were losing friends fast, but I just didn’t want to give up on something that I knew was the greatest place in Toronto. Alas, the court case was decided in the landlord’s favour, and other factors kicked in. While Hitti says he had been attempting to negotiate with the landlord, other people, including Nevio Persia and David Morales, are reported to have made a separate offer. Boa Redux during brighter days and nights. Photo courtesy of Carey Britt. Boa closed with a big party on August 28, 2005. Sean Miller played a 12-hour set. 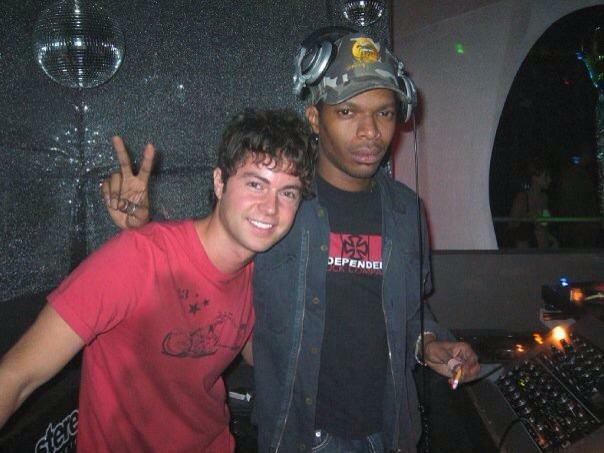 Miller also went on to DJ at Sonic, which opened late April 2006 and closed less than a year later. 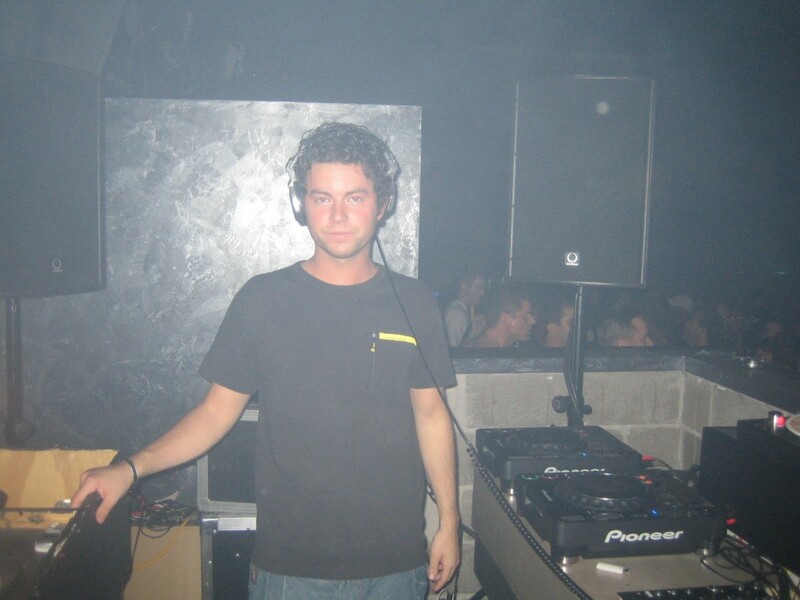 Miller continues to tour globally, and plays occasionally on home turf. (“I sort of lost touch with Toronto, and my goal is to find a residency here.”) His next release will be the This Is That EP, out soon on Josh Wink’s Ovum label, and he is at work on a collaborative project with legendary guitarist and vocalist Jose Feliciano. Like Miller, Britt worked at Sonic, but feels its Boa’s legacy that remains. Hitti himself wasn’t able to replicate Boa Redux, though he tried with a short run of events at 360 Adelaide St. W., former home of clubs including Turbo. He also produced a number of parties at 99 Sudbury, before its renovations, where parts of Boa’s sound system were put to good use. As for Erica Kelly, who followed Hitti to Boa Redux on Adelaide and then worked as Operations Manager at Sonic, she went on to bartend at Footwork, as well as work at clubs including Sound Academy and CiRCA. Although she now works for an airline, Kelly can occasionally be found holding down door duties for some of her favourite promoters and events. 270 Spadina is slated to reopen as the 10-storey Dragon Condos in 2015. Thank you to participants Carey Britt, Erica Kelly, Rony Hitti, and Sean Miller, as well as to DJ Demi, Jeff Button, Mat Lunnen, and Ralf Madi. Lots of nostalgia reading this article as I moved to Sydney in 2005 and Boa just spoiled the clubbing experience for because it was just that goddamn good for all the reasons this article has pointed out. Enough said. Miguel Migs at Boa goes down as one of my favorite all time parties of the 2000′s. Legendary! Another great piece from Denise B.
Toronto has no respect for the nightclub. Wish there were more people trying to build venues like this instead douchebag bottle service joints. Even those are under assault. 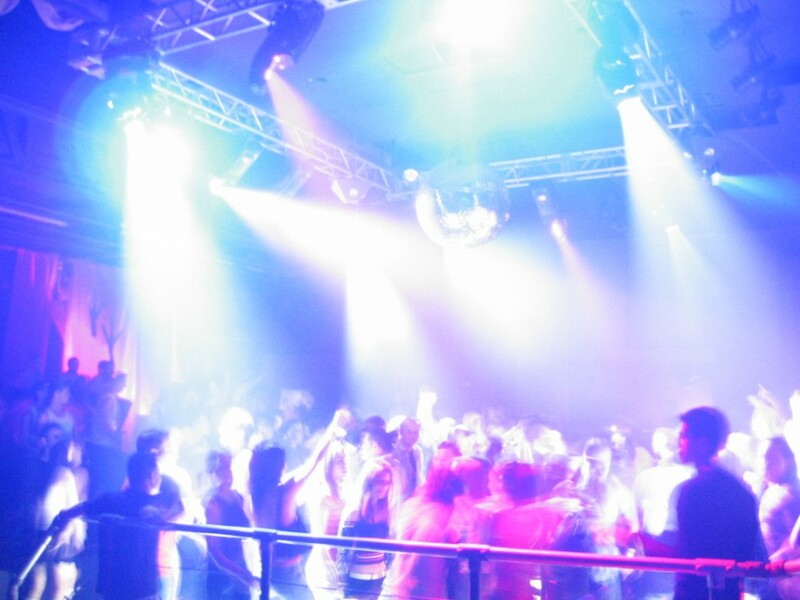 Clubs in particular are paying the price – but TO is definitely losing its soul to “Condo is King” movement, the boxes in the sky that people rent for 5 years before moving to the burbs.